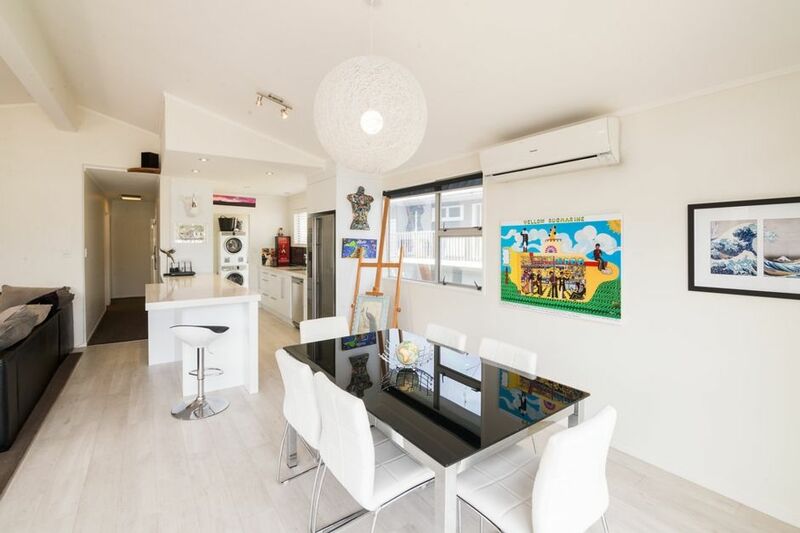 This two bedroom townhouse is modern and clean and right in the hub of Mt Maunganui .You'll find great restaurants and bars literally at your door step. Both the main beach and harbour are within easy walking distance. The gourmet night markets are held on a Friday night across the road in the summer months as are the Little big markets held once a month. There is plenty to do in the amazing seaside resort or you may choose to chillax on the north facing deck with a glass of vino or enjoy watching netflix on the large TV. Ideal for 2 couples or families who want to be close to the action. Please note that there is a self contained unit downstairs of the townhouse where the owner occasionally resides. It is quite separate from the accommodation upstairs. Please give details when inquiring if you are a family group or a group of friends and what the ages of your group are . Fantastic place set within the heart of the mount, 5 min walk to the main street. Would definitely stay again. The location handy to the shops and beach enabled easy access on foot, leaving the car out of the traffic jams over the New Year holiday week. The space is comfortable, clean with the art work providing added personality - a memorable stay and we would love to visit again. We had a great stay, The home is as advertised and conveniently located. Kristin has been easy to communicate with, she responds promptly and has been very accommodating. We really loved our stay here, everything we needed travelling with a baby and our 12yo son. Great location easy to walk to cafes, shops and the beach. Warm and comfortable. Would definitely recommend to others and would stay again. Super location and great bach in a beautiful little town. Super location and great bach in a beautiful little town. Comfortable walk to Mount Maunganui and the beach even with our 6 year old. Loved the kitchen and the decorations, wished our kitchen at home was as nice. Very comfortable beds, best sleeps of the vacation.